This will be the last article I will write about the Real Time Abductee group I have been involved with for the last year. For those not familiar with the Real Time Abductee group I am referring to let me explain that they are a group of normal everyday people who while fully awake going about the routines of their normal days were taken. Who or what the beings are that are taking people like the ones in this group remains unknown. All the people know, who are members of this group , is that against their will , going about their daily business- they were taken, experienced lost time and were returned . The abductees can recall the start of their abductions and being returned disoriented and usually ill but have very limited or spotty recall of what happened to them during their lost time. I am writing this last article about the group to try to cover a few items the abductees wanted to touch on before ending our meetings and my Real Time Abductee articles. The abductees want to once again warn those who continue to claim falsely that they have been abducted to please stop and reflect on how much damage they are causing to the issue of real abduction. Ridiculous reports filled with more Hollywood script than reality has over run the internet to the point of revulsion. How do you think a kidnapped abused victim feels when they find they not only have been taken against their will, abused and violated to find they are alone without any where to go for help? Do you realize that while you are busy fabricating the next big story you are adding to the hardship of trying to find help by those really experiencing these horrors? Do you understand that not only you but those you love could become the next to be taken and harmed only to find you too will end up alone and laughed at? As long as you continue to create, by the truck loads, fake reports and ridiculous tales of colorful abduction you will keep those who are really taken alone and unable to find help. Do you really want to be such a cruel person because or your hope for fame or a need for attention? Please stop doing these things . If you think you have the next big book that your fabricating for hopes of fame, funds and a movie deal with your name across the title please research the facts of that happening and know that is not going to ever take place. Each day writers like me are flooded with those who have long colorful stories they want me to write about so they can get a good book deal. I wish I had a nickel for every person who has thought this subject and their made up story was going to be the next blockbuster hit. I can assure you that the days of wild tales bringing big bucks in this subject matter is long gone. This is an extreme problem as not only does it waste time and energy of those looking to find true reports it keeps those with real experiences shy of coming forward in fear of being lumped together with all the liars , frauds and weird stories that have no truth to them at all. Trust me real abduction is far from the typical colorful stories you easily find plastered all over the internet world of the paranormal. If you need attention and you are lonely please find a friend or reach out to others in some other form but stop making it so miserable and dangerous for those who are suffering real abductions . Unless we take this seriously and help those who are being taken and harmed it will not stop. In fact the numbers may increase and we would be ignorant to the problem growing as we are so busy lying about what is really going on. I know my words will not change anything but do know with each lie you tell you hurt with a hard blow some poor person who has suffered the unknown and has to go it alone without help or understanding. The group of real time abductees took part in my articles making sure I wrote about things they wanted to share. The group was also active in sorting through my emails that arrived concerning the articles I wrote about them They were very curious to the reaction of those reading what they had to say by way of my hand. Their reaction of the abductees to the emails was one of sadness. It did however help them towards a closure concerning their involvement in trying to reach out to the world of the paranormal. They had a small hope at first in finding those would have a real interest in finding the answers to the unknowns . It was a need all the abductees had to make one attempt to reach out to see if the subject was going to ever be taken seriously before they gave up hope completely on ever finding serious interest in this growing problem. I did receive emails from those who were reading the real time abductee articles as I do with most articles I write. I did allow the group to read all the emails sent to me concerning their articles . Sadly I must say that the reaction of my readers was the final blow that slammed closed the door of the real time abductees wanting to continue with trying to reach out to the public on this subject. One silly paranormal show sent an extremely obnoxious note wanting to know if we wanted to be on the show as it would be a big opportunity for us. We had to wonder what they were smoking over at that show? How would giving our names and faces over to public TV help us? There is no financial reward, no security offered much less protection from what may happen to these people long after this TV show is long gone. I find these people despicable vile people who feed on others. They are nearly as abusive as the abductors. I can only think of risk and harm coming to any abductee who would agree to such a dangerous idea. The last thing anyone who has endured a real abduction wants is to have their life completely destroyed by some nit wit TV show. Did it ever occur to these fly by night shows that they could end up devastating the people they do this to? 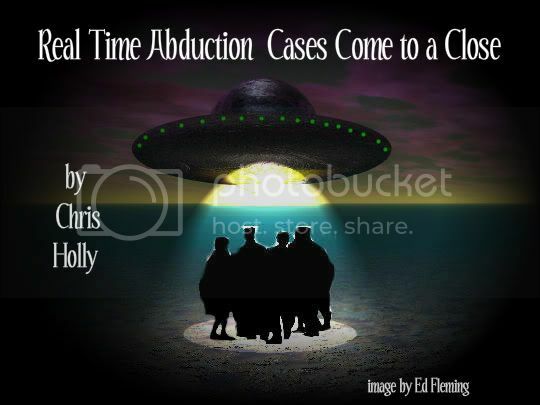 The real time abduction group was a onetime experiment by this group to see what the public as well as those who claim they are researching this subject would do to their coming forward. This group wanted to see if there were any signs of change or willingness to move forward in a science based want and need to know concerning who or what is kidnapping so many people worldwide. This of course did not happen. The group was shocked at how many people continued to write to me after reading about the hardships they have endured over much of their lifetimes about obvious and ridiculous tales of fiction . It made them both furious and frustrated as it displayed how the public ignored what was talked about in their articles showing the subject of abduction is not taken seriously at all. It also made it clear we have a unhealthy population of lost souls using this subject matter to cover or hide some real deep emotional problems . We did have emails from those who truly needed help but decided instead to consider all their problems the result of abduction. This of course is very dangerous on many levels. One of my long time readers sent me an email that explained to us that the public has had a mountain of fake reports, made up stories, CGI videos and photos dumped on them to the point they are not able to think clearly. She explained to us that so much garbage is out there that at this point it is simply impossible to decipher what may be real to what is just another jerk adding another fake to the mess. We understood what she was telling us and knew that there was no reason to think we would be believed. We could see we were being looked at with the same eyes as all the other garbage out there. She was right, we were just one more good story. No one believed anything anyone said at this point. A perfect set up for those who want to do whatever they want with a society who does not believe any of it. We did spend time trying to warn people about many serious issues. It saddens us deeply that numb eyes may have been lost to the warnings due to being brainwashed for a very long time to ignore, reject, laugh or yawn through anything considered paranormal or unknown. To many it is just another horror story . The abductee group knew that the paranormal was long lost to entertainment and would not be a place for truth or serious study until the day aliens as well as many other unknowns land right on the white house lawn forcing society to understand it is not a big joke . We feel horror at this knowledge as we know it may come down to that end which will bring fear and panic not to mention complete chaos to a society who should be far more advanced on these subjects however sadly are not. We were fascinated by the fact we all talked openly in the articles about sharing above average IQ.s as well as all having rare blood types along with other similarities yet no one showed any interest at all. Not one person, not one researcher or professional or well known paranormal group had any questions for us at all. No one wanted to find out about our blood or even give us an IQ test ! The fact we openly talked about the fact we all have very obvious physical changes and problems we deal with was really interesting. It was very curious to us that not one person, group or researcher asked what the physical things were much less if they could see them or have an expert of any kind examine us . Don't you find it odd not one person , group , researcher or professional has been curious enough to see what is wrong with us or what was done to us? We sure do. The real time abduction group realized they were not going to make any changes or find any advancement via my articles and the decision was made to stop our meetings and continue on with our own lives apart without any further connection. There was one last reason for us to disband and go our separate ways. We realized as time went by that when together we would start to think as one. The abductee group felt more like one mind forming with parts made up from each member but working as one. It was not normal and it was frightening . It also answered questions we all had in the group to the depths of how much we had been altered. This strange one mind thinking was not something we thought should continue . It was not something the abductees felt comfortable with or wanted to increase. It was decided that this was one road we did not want to travel. During our time together we did discover our combined fear concerning the devastation of man by way of the technology being fed to us as a way of life . The group feel it is our way to our own end. It also is an obvious and easy form of control by those who would want to control us. I covered all of that in my Devastation of Mankind article as one of the real time abduction articles. What I did not talk about is the last warning or maybe prediction the real time group has for those who may be interested. This group feels a huge change has taken place in the world of the paranormal. It seems to be happening faster with each passing month. If you have been a fan of the paranormal world and have been following it for years you have noticed changes . Many sites have slipped away, many bright people have slipped away. Much of what remains is a limited list of places that seem to carry the same things by the same people without any real growth or advancement. Major changes have taken place with sites with complete overhauls leaving the sites looking broken and lack luster having them lose popularity each and every day. New sites pop up but many struggle while others with a leaning towards a dismissive or humorous attitude concerning the paranormal are opening well funded and obviously backed by those with huge wallets who want to control the unknown and keep it comic strip rather than understood. We have to wonder if those who control the truth of all things we do not understand have taken a lock down action to keep us all dumb and giggling about things we consider unknown so they can continue to do as they wish without being disturbed by a questioning public. It has worked so far to keep us ignorant and blind to what is going on around us. Simply Hollywood ize the subject and keep us brainwashed with muddy thinking so no answers need be given to all the odd and strange things going on each and every day around and above us . We have to wonder where are the conspiracy theorists concerning the obvious changes and controls that go on in the world of the paranormal? One of the real time abductees used my account on Disclose TV to post the articles I was writing as he felt it was extremely important to reach as many people as we could about our warnings and thoughts. I must admit I was very busy at the time and not following what he was doing too carefully. He was posting parts of my articles on the site regularly hoping for as many people as possible to read what I was writing. One day I got an email from that site simply saying I am banned and cannot come back or post there again. I questioned the abductee who has been posting my articles on the site but he had no idea why they took this approach. I wrote to the site and asked them what we had done to be banned to see if I could repair the damage. I sent numerous emails but never was given a reason or return email . I remain banned to this day. How can we ever grow if this is how we act towards one another in subjects that need care not control? The Real Time Abductee Group had one last meeting just before Christmas . We had a normal gathering with a grab bag included under a Christmas tree feasting on all the goodies people share during the holidays. I had a heavy heart knowing we would not be meeting again . I share a bond with these people that others simply could not understand. I also knew it was the best for us all to return to our own lives . As a group we can say we did what we could to see if society, research, or any science based group would be interested in what we had to say concerning what we had encountered. If a serious group came to us we would have let them examine and speak to us given our privacy was protected. When no such person or group came forth we knew we could close this chapter of wanting to help or reach out without regret and continue on with a life of privacy and protection . We no longer carry any guilt concerning not warning others or not sharing our encounters. We tried and now can with a clear conscious carry on with our private lives without guilt . Nothing will change unless a major event hits without warning . If that turns out to be the case with society not being prepared it will be a mean harsh shock that may rock the world into panic and disaster. Unless we learn in matters of the unknown to remove the wheat from the chaff we will sit in our own ignorance. We are long overdue to separate what is useful or valuable from what is worthless in the subjects of the unknown. Until that changes nothing will be known and many subjects will remain mysteries that we really should understand. This is my conclusion with concern to the real time abductee group. May we all find peace and safety in a world full or chaos and unknown darkness.